Great location, friendly welcoming and helpful staff. Room compact but extremely well appointed and designed. Where to find Helsinki hotels near an airport? How can I find hotels in different Helsinki neighborhoods? Where can I find hotels in Helsinki that are near tourist attractions? When the time comes to plan your Southern Finland sojourn, you'll find a huge selection of quality stay options in Helsinki. Expedia lists no less than 71 hotels within a 0.1-kilometre (0.06-mile) radius of central Helsinki. Location is important when it comes to stress-free vacationing, so check out the latest offers at the Hotel Kamp and Klaus K Hotel, which you'll find a short distance of Helsinki's city center. The suburb of Vantaa, a popular hotel area in Helsinki, offers 17 hotels and apartments. Vantaa is 16 kilometres (10 miles) from the heart of Helsinki and is one of the more commonly visited hotel neighborhoods. Choose from a range of hotel establishments including the GLO Hotel Helsinki Airport and Hilton Helsinki Airport. Another area to stay is Espoo which is approximately 16 kilometres (10 miles) from downtown Helsinki. Espoo has 17 hotels, including the Radisson Blu Hotel, Espoo and Original Sokos Hotel Tapiola Garden. Another popular place to stay is Meilahti. Meilahti offers the Original Sokos Hotel Pasila and Cumulus Meilahti. Or, try Taka-Toolo, where you'll find the Crowne Plaza Helsinki and Scandic Park Helsinki. Royla is 18 kilometres (11 miles) from Helsinki's downtown, while Tuusula is 35 kilometres (20 miles) from the heart of Helsinki. The Hotelli Korpilampi and Espoo Sun Cottages are in Royla, while Krapi Hotel and Gustavelund Hotel are situated in Tuusula. 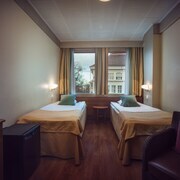 The Hotel Haven and the Scandic Simonkenttä are situated conveniently close to Presidential Palace. The Hotel Fabian and the GLO Hotel Helsinki Kluuvi are near Kiasma Museum of Contemporary Art. The Ateneum Art Museum, another important Helsinki attraction, is walking distance from the Solo Sokos Hotel Torni and also the Radisson Blu Plaza Hotel, Helsinki. Hotels near the Senate Square include the Radisson Blu Aleksanteri Hotel, Helsinki as well as the Original Sokos Hotel Presidentti. If you're traveling on a tight budget, you'll be delighted to know that there is a broad selection of cheap and cheerful hotels in Helsinki. 0.09 kilometres (0.06 miles) away from Helsinki's center you'll find the Scandic Marski. The Hotel Helka is just 0.8 kilometres (0.5 miles) away. 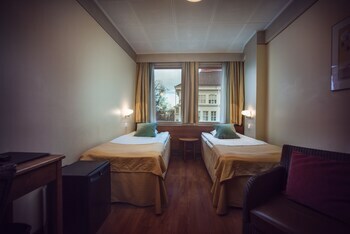 Additional lower-cost hotels include the Cumulus Kaisaniemi and the Best Western Hotel Carlton. The Hotelli Seurahuone Helsinki is located 0.2 kilometres (0.1 miles) from the middle of Helsinki. Alternatively, the Hotel Anna can be found 0.7 kilometres (0.4 miles) away. Other accommodation options worth looking into are the Hilton Helsinki Kalastajatorppa and the Rivoli Jardin Hotel. 95 kilometres (59 miles) to the north of Helsinki you'll find Hameenlinna, where you can spend the day visiting Hame Castle and Hattulan Kirkko. Hameenlinna accommodation options include the Spa Hotel Rantasipi Aulanko and Cumulus Hameenlinna. Or, you could stay in Lapinjaervi, 85 kilometres (53 miles) to the northeast of Helsinki, where you can choose from the Hotel Hanhi and Hotelli Hanhi Cottages. The Lapland Lake Church and Rutumi Manor are just a couple of the more popular points of interest to experience when you're in Lapinjaervi. Located 17 kilometres (10 miles) from Helsinki is Vantaa Airport. Stay nearby at Airport Hotel Bonus Inn or Cumulus Airport. What are the most popular Helsinki hotels? Are there hotels in other cities near Helsinki? What other types of accommodations are available in Helsinki? Explore Helsinki with Expedia.ca’s Travel Guides to find the best flights, cars, holiday packages and more!